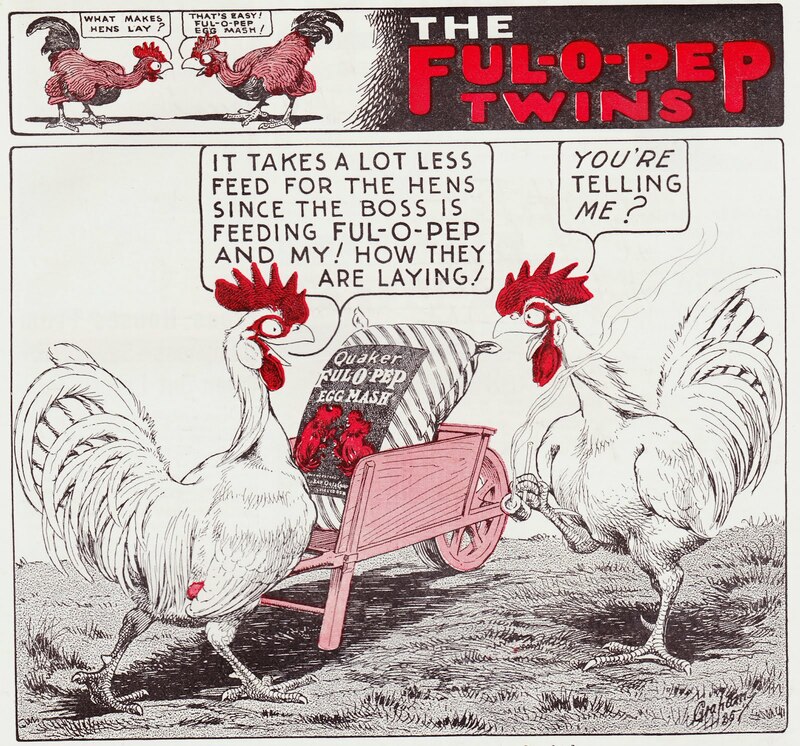 Above: Here, from the October 1935 issue of Poultry Tribune, are a pair of cartoon chickens hawking Quaker Ful-O-Pep Egg Mash, from The Quaker Oats Company. 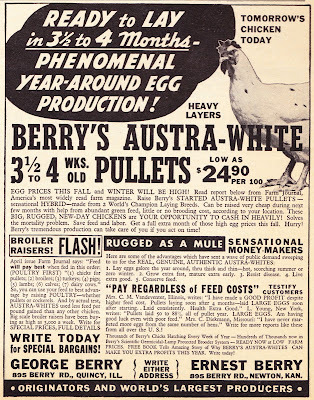 The ad copy states: "Hens or pullets that start on a promising cycle of heavy laying and then suddenly 'blow up'1 are not profitable. Proper feed and feeding of the layers tends to reduce this mortality. 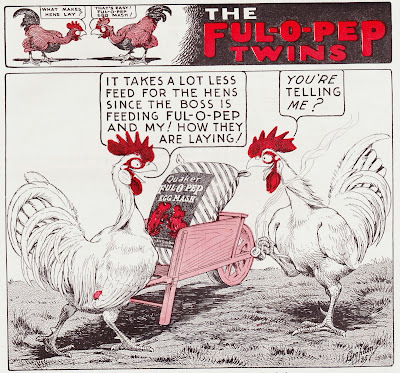 Fed the Ful-O-Pep way hens will produce more and better eggs and live longer." Above: This advertisement comes from the same issue of Poultry Tribune as the one for Quaker Ful-O-Pep Egg Mash. 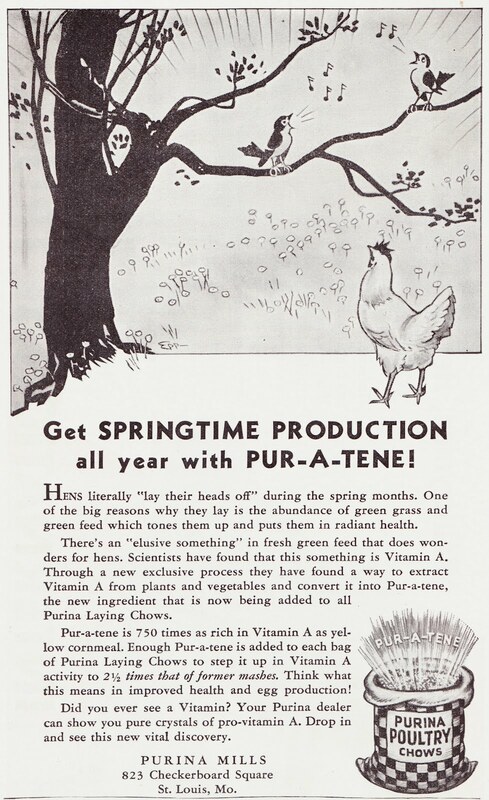 Here, we have Purina Mills touting its Pur-a-tene. 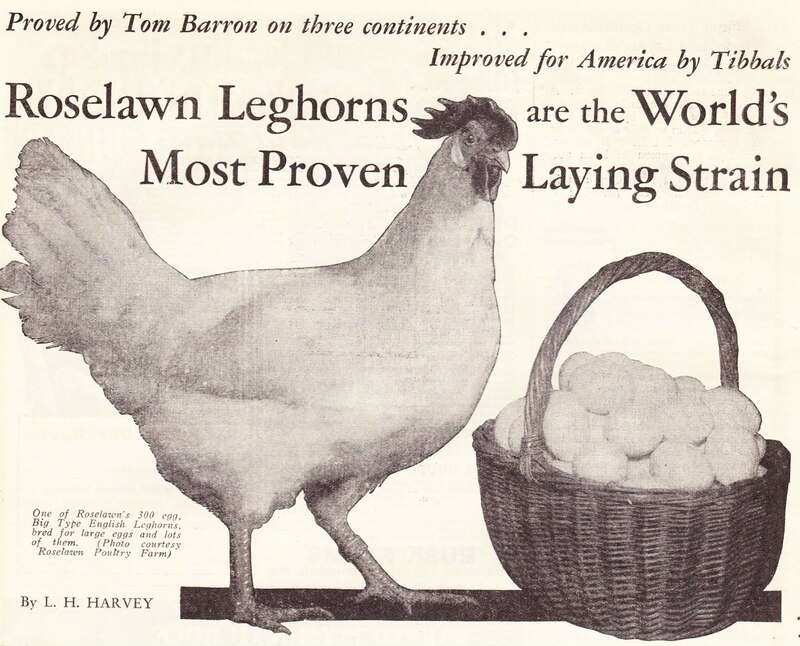 The ad copy states: "Hens literally 'lay their heads off'2 during the spring months. One of the big reasons why they lay is the abundance of green grass and green feed which tones them up and puts them in radiant health." 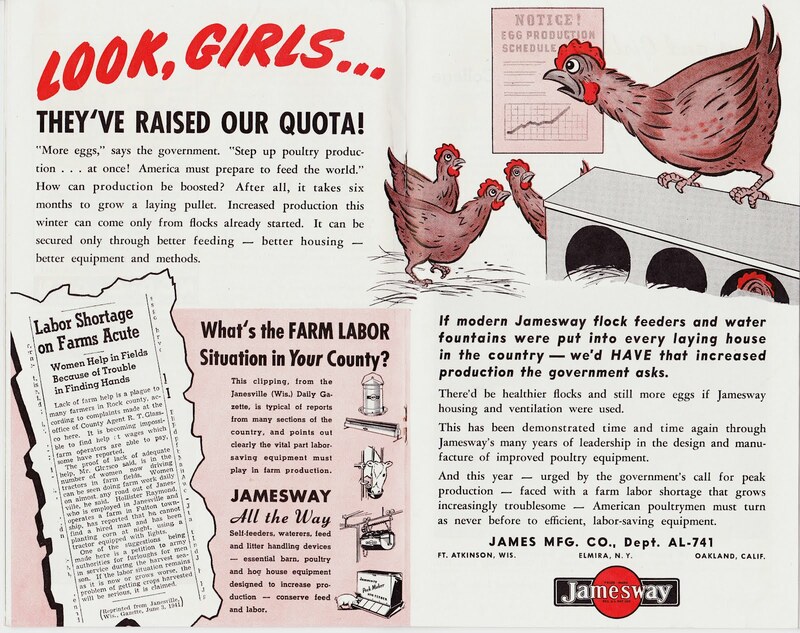 Above: This wartime advertisement from Jamesway Mfg. Co. comes from the July 1941 edition of Agricultural Leaders' Digest. The ad copy states: "'More eggs,' says the government. 'Step up the poultry production ... at once! America must prepare to feed the world.' How can production be boosted? After all, it takes six months to grow a laying pullet. Increased production this winter can only come from flocks already started. It can be secured only through better feeding -- better housing -- better equipment and methods. ... If modern Jamesway flock feeders and water fountains were put into every laying house in the country -- we'd HAVE that increased production the government asks." 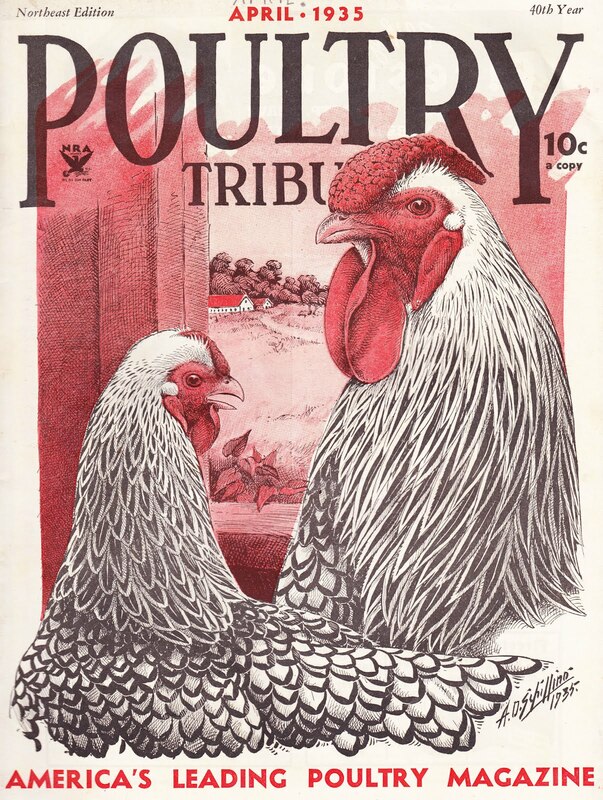 Above: Here is the wonderfully illustrated cover of the April 1935 Northeast Edition of Poultry Tribune. Articles in this issue include the "Egg-A-Torials" by editor O.A. Hanke, "How Much Protein? ", "How We Sell Direct! ", "Spring Eggs Need Special Care", "More Turkeys! ", "Homemaking! ", "Buying a Poultry Farm", and "Quality in Northeast Eggs". They sure did like their exclamation points. Above: And, to finish up, here is one more chicken item from an issue of Poultry Tribune. This is the illustration for the L.H. Harvey "article" titled "Roselawn Leghorns are the World's Most Proven Laying Strain" from the February 1933 issue of the magazine. I put article in quotation marks because, while everything else about this page -- including the headline, typography and layout -- looks like the other articles Poultry Tribune, the article concludes with "--Adv." And that makes me think the whole thing is a paid advertisement. Do you think 1933 readers were savvy enough to tell the difference? Especially with such little indication that this was different from other material presented in the magazine. 1. Not literally, I hope. We can't have chickens blowing up. 2. Not literally, I hope. We can't have chickens' heads popping off. What's with all the chicken violence? I love you, Papergreat AND chickens. Happy 400. Love, Peach.